When it’s your birthday, you get to be the king or queen for the day, and royalty deserves a grand entrance. Make a birthday party for yourself or a loved one something truly special with confetti birthday party supplies from Flutter FETTI. 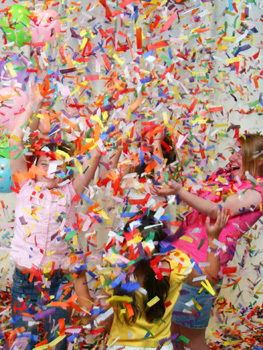 Kick the party into high gear by showering the guest of honor with a confetti frenzy! Our birthday party streamers and confetti create magical moments and our custom FETTI colors make it a breeze to coordinate with your party color theme. You’re going to love the look on everyone’s faces as they light up with happiness! After you flick with your wrist the tube filled with Tissue Flutter FETTI then you can swish the POMPOMs in the air continuing the party celebration. At Flutter FETTI, we’ve spent countless hours designing a special type of confetti that floats in the air for up to 10 times longer than other confetti brands. Our high-flying, fluttering confetti lets you soak in the special moment and take plenty of pictures with your friends and family. Our signature Flutter FETTI® consists of brightly colored rectangular pieces of tissue paper or metallic film designed to float gently in the air for up to ten times longer than those old-fashioned dull and heavy microdots. The result? A breathtaking (and memorable!) moment as you get a kaleidoscopic symphony of color and fun! Watch your guests launch a rainbow of Flutter FETTI birthday party streamers and confetti into the air as the guest of honor blows out the candles on their cake! Nothing makes the birthday boy or girl feel more special than being showered with a colorful burst of birthday streamers and confetti. It’s like having a parade thrown in their honor! 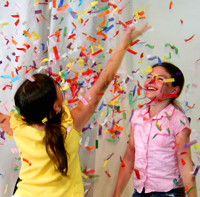 Our confetti birthday party supplies add the “WOW!” effect to your special day! We hand-dip every piece of confetti in flame-retardant chemicals, which means you don’t have to worry about the candles on your delicious birthday cake. And if your birthday party is outside, our Flutter FETTI is biodegradable so it won’t hurt the environment. Growing a year older is more fun than ever with birthday party streamers and confetti from Flutter FETTI. 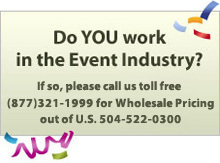 Make your next birthday one to remember! Flutter FETTI when saturated with any liquid and under pressure may bleed color, and Flutter FETTI® cannot guarantee or warranty that it will not do so. If any liquid will or may be present at an event, please consult with us so we can assist you in choosing water-safe FETTI® confetti birthday party supplies and products.